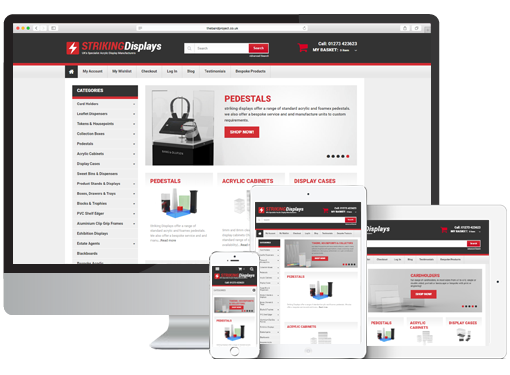 Striking Displays Ltd – a specialist UK based acrylic display manufacturer based in Portslade, East Sussex asked us to design and develop a new e-commerce website which would improve both the customers online experience as well as streamlining in-house workflow and easy online order management. The team at Striking Displays wanted to have a new contemporary, mobile responsive design and layout, which complemented their brand identity. As well as design, layout and a better user experience Striking Displays also required some additional functionality requirements, which you do not usually see in standard online stores. These requirements included customised formula pricing, they wanted customers to be able to enter their own dimensions for products, the price would then adjust according to the required size. Another critical requirement was the addition of a bespoke enquiry form and product page inquiry forms as a lot of products they create are bespoke and made-to-measure. To enhance the users experience other features were also required such as, people also bought, drop sell, cross sell and call for price as well as a fast, uncluttered secure shopping cart which supported SagePay payments and Invoice payments. With Striking Displays being one of the Uk’s leading acrylic manufacturers, the stakes were high and we needed to rise the the challenge and deliver the perfect solution which fulfilled their design brief, functional requirements as well as exceeding their expectations. We discussed a number of E-commerce platforms but the solution proposed and decided upon was the Magento platform. Magento provided scalability, security and the ability to develop and customise to their requirements as well as providing an easy-to-use administration area for their in-house team to manage orders, customers, products, content and really take control of their online store. The design and layout of the e-commerce site focussed on complementing the Striking Displays current branding, but bringing a new, contemporary and attractive, fresh feel. The layout and page elements were also designed to provide the best, optimised user experienced when navigating through the site. The layout was designed to be mobile, tablet and desktop responsive, so no matter which device a customer is browsing on, they will have be able to navigate around the site with ease. We also added the additional functionality for custom formula pricing, allowing the user to enter their own dimensions I.E different lengths, widths and depths to a product. Once the user had entered the dimensions the price then adjusted to required size. This was controlled by adding a mathematical formula in the admin area for each specific product. Additional functionality allowing the user so see what other people had purchased was integrated, call for price and enquiry options as well as drop sell and cross sell product features. A secure easy to use checkout was implemented with SagePay integration as well as the ability to pay by Pro Forma Invoice. The checkout, customer area and admin is secured by a Star Field Technologies SSL Certificate with a SHA-2 and 2048-bit encryption. We also provide secure, fast VPS hosting delivering the Striking Displays E-commerce store to the internet at lighting speed and faultless uptime.